I start college in 8 days. 8 days! That's crazy, I can't believe summer is basically over. I think I've forgotten how to hold a pen let alone write whole essays or speak in French. This is going to be the first time that I don't have a uniform so I'm guessing its going to be difficult to make up an outfit everyday. What I've tried to do is by simple pieces that can be used for several different outfits throughout the year. 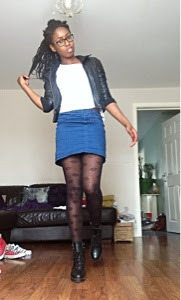 This blue skirt that I bought from New Look for £6 is the focus of this post. 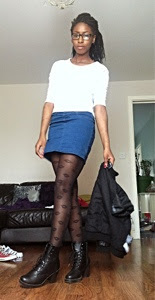 I've created three different looks around this skirt to show how it can be worn in different ways for different seasons. Here I've put on loads of layers to make a winter outfit. 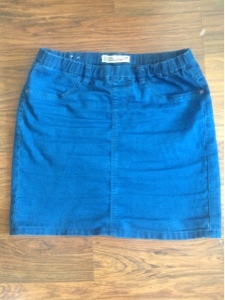 This can also be worn in autumn by wrapping the coat around your waist or just leaving it our completely. 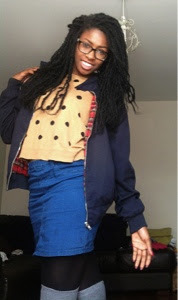 Jumper- Primark (I bought it last year). I think this is my favourite of all my outfits. It's quite simple but then I made more fun by wearing lip printed tights. In this outfit I paired the skirt with a neon pink crop top and lilac jelly sandals for a summery look. The great thing about this skirt is that it's really simple so can be worn with literally anything and is such a wardrobe staple.